Heat oven to 425°F. Grease 13x9-inch (3-quart) glass baking dish with shortening or cooking spray. Remove 1 pie crust from pouch; unroll on work surface. Roll into 13x9-inch rectangle. Place crust in dish; trim edges to fit. In large bowl, stir corn syrup, brown sugar, butter, vanilla and eggs with wire whisk. Stir in chopped pecans. Spoon half of filling into crust-lined dish. Remove second pie crust from pouch; unroll on work surface. Roll into 13x9-inch rectangle. Place crust over filling; trim edges to fit. Spray crust with butter-flavor cooking spray. Bake 14 to 16 minutes or until browned. Reduce oven temperature to 350°F. Carefully spoon remaining filling over baked pastry; arrange pecan halves on top in decorative fashion. Bake 30 minutes longer or until set. Cool 20 minutes on cooling rack. Serve warm with vanilla ice cream. Cobblers, a classic American dessert, come in many different flavors and forms. Some cobblers are full of fresh fruit, like peaches or berries, and get topped with biscuits. 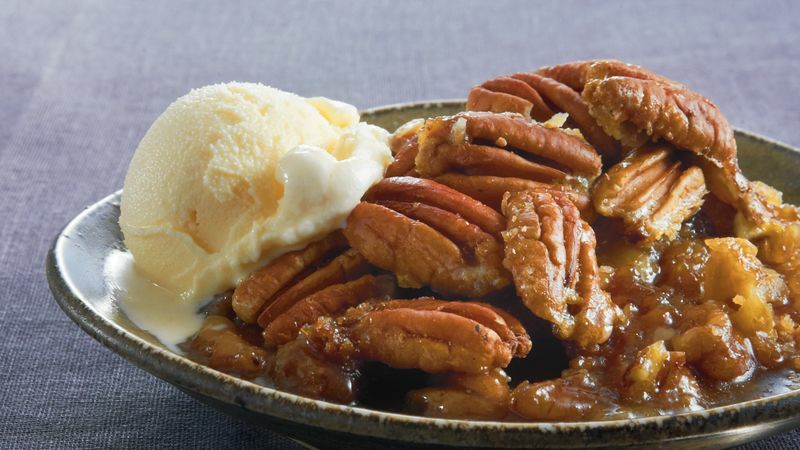 Other cobbler recipes, like this pecan cobbler, resemble a deep-dish pie and are also filled with fruit or other sweet fillings like this pecan pie mixture. Whichever way you make your cobbler, we can all probably agree that a sweet filling paired with pastry dough is pretty hard to mess up, and always tastes delicious. You may confuse cobblers with crisps and crumbles, which is understandable since they are very similar desserts. The differentiator is the topping. You’ll often find that oats are a big part of the crisps and crumbles toppings—you won’t find that in a cobbler. Cobblers are all about the dough. The dough may be brushed with butter or sprinkled with sugar and/or cinnamon before serving, but oats are never added.